Betting shop on South End. As of July 2012, it was vacant and advertised to let (but under offer), with signage indicating it used to be a restaurant called Desi Hut photo. 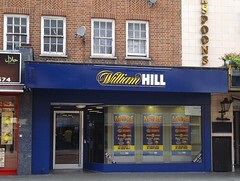 In September 2012, the William Hill betting shop chain was granted a planning application for display of an exterior sign (PDF), and in October 2012 they were granted another planning application for extended opening hours as a betting shop. Last edited 2019-01-06 14:29:03 (version 33; diff). List all versions. Page last edited 2019-01-06 14:29:03 (version 33).